Imprint on cap or body, or both. Lose that plastic casing, and go with bamboo for your USB drives. It is a nice mix of the natural and technology. Bamboo is a bit better than the plastic casing most USB drives come in. The Bamboo Drive from All-in-One comes in memory sizes from 512 MB – 16 GB. Decoration on the casing can be color screen print or laser engrave. I still like Bamboo drives as a simple way to mail, or handout, a lot of information. Videos, music, sale presentations, pre-loading the drives can easily be done at the factory. 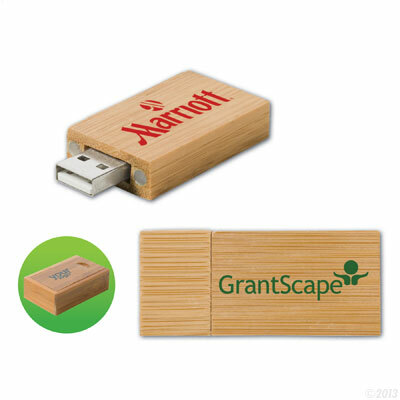 Any marketing campaign working on a warm, natural feel, will benefit from the use of a natural casing flashdrive. If you are interested in Bamboo USBs to promote your own business, or to get a sample, email info@proformagreen.com for information and pricing.